Directories and Almanacs are a valuable resource for local, family and social historians as well as for researchers in other fields of Australian history. They provide you with information on the region that your ancestors lived, as well as information on their occupations and location. This data set contains five different directories: 1895 (Hall), 1899-1900, 1925, 1926 and 1929. It’s a valuable genealogy resource for anyone exploring their family history or building a family tree. 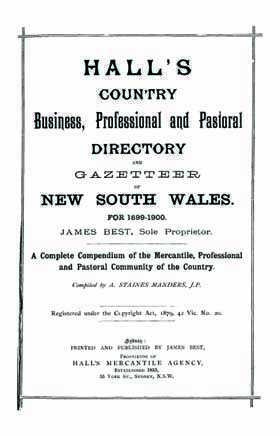 This edition of Hall's Business, Professional and Pastoral Directory and Gazetteer of New South Wales for 1895 is divided into three major sections. 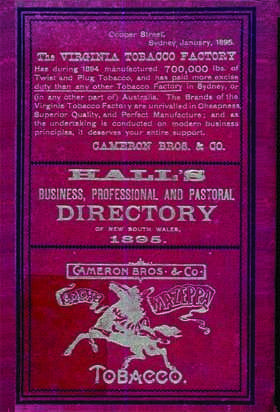 The New South Wales Country Directory 1899-1900 (Hall) is divided into four sections. These years are divided into two sections, the Australian Almanac and NSW directory. They contain invaluable information on places and people, throughout New South Wales and include a large colour map of NSW towns, rail and coach lines and other transport options. The NSW directory contains a list of New South Wales towns over about 500 pages. A valuable resource for those with family in New South Wales at this time. Under each town it shows the distance from Sydney, transport options, climate description, county name, police district and population. This book contains easily accessible lists and information on hundreds of towns and thousands of people involved in different positions and trades across New South Wales. Depending on the size and services of the town the following may also be listed, and include the names and positions of people involved. Commercial lists including auctioneers, bakers, blacksmiths, tailars etc.